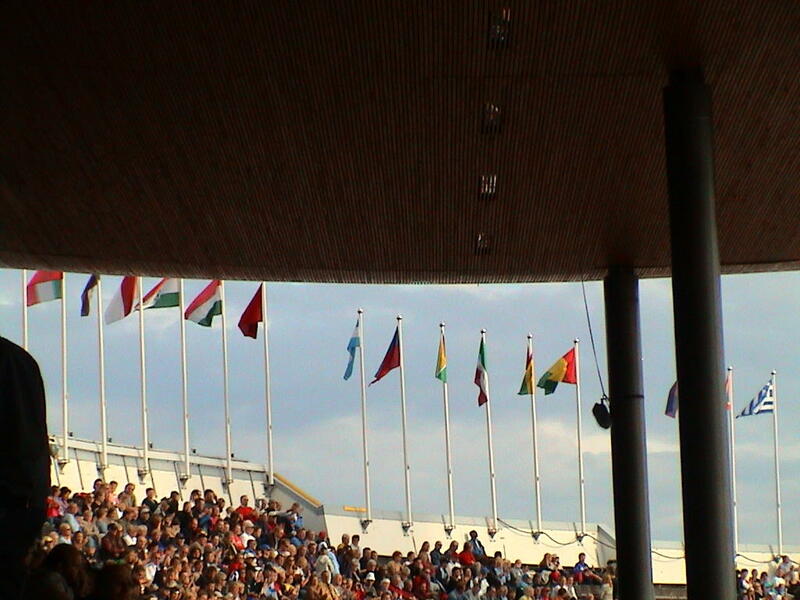 I finally got to see the event as I wanted – on the eve of the closing ceremony. After scouring the venue for 2 days we finally got the tickets of the closing ceremony (14th Aug) for D-upper section (originally 155€) in 35€. Now I can pat my back for my bargaining skills. We ultimately sat in the D-lower section (since our seats were already occupied!) which suited us even better. The calculated risk, that we took by waiting for the closing ceremony and not watching the event before that was not really needed. We expected much fanfare for the closing (like in the opening ceremony) but all that happened was ‘victory ceremonies’ – in other words, medal distribution. Had India been there somewhere, it would have made sense. It seems that even a country like Finland unexpectedly has its own market of ‘tickets in black’. Only these tickets are not costlier than the officially available ones (like in India), instead they are cheaper, but not very. Some agents were even selling them at the same rates as the official ticket stalls! It all depends on the date, the timing at which *you* buy it and the date/timing for which you want it, the section of the stadium (in which one wanted tickets) and then of course ones bargaining skills. These agents seemed to be foreigners too. Moroccans to be precise. That’s what I learnt when I asked a couple of them where they were from. One of them wished me ASAK and I responded back instantly as if I had been doing it all my life. Another asked me how long it took for my hair to grow ‘that’ long and labeled me as ‘the lady with the long hair’ for the next 2 days. Watching this kind of an event was great. It was a first for me inside a stadium as I am not a sports freak anyway (I detest cricket even more so because it’s fed so much to us Indians in our daily diet). It was also a first for even an event of that magnitude! I saw a world record happening in front of my own eyes and not on the camera for a change. 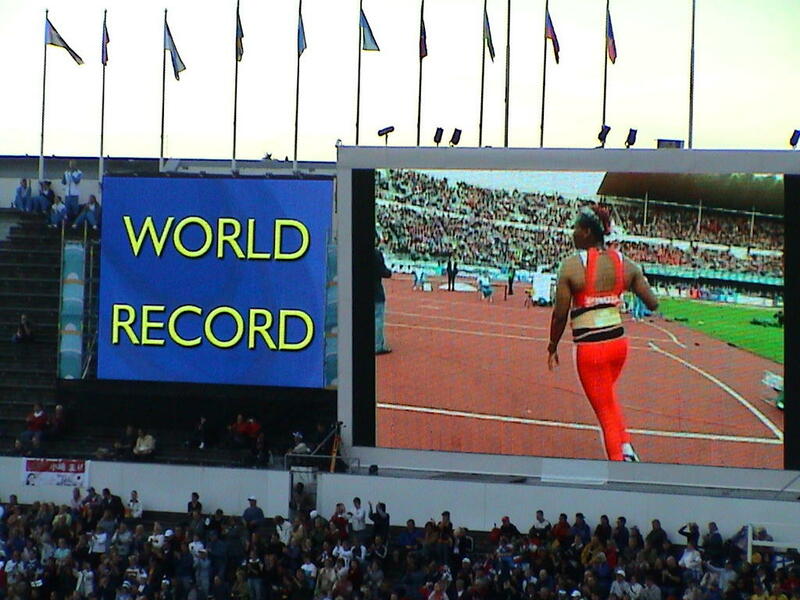 Osleidys Menéndez from Cuba made this world record. 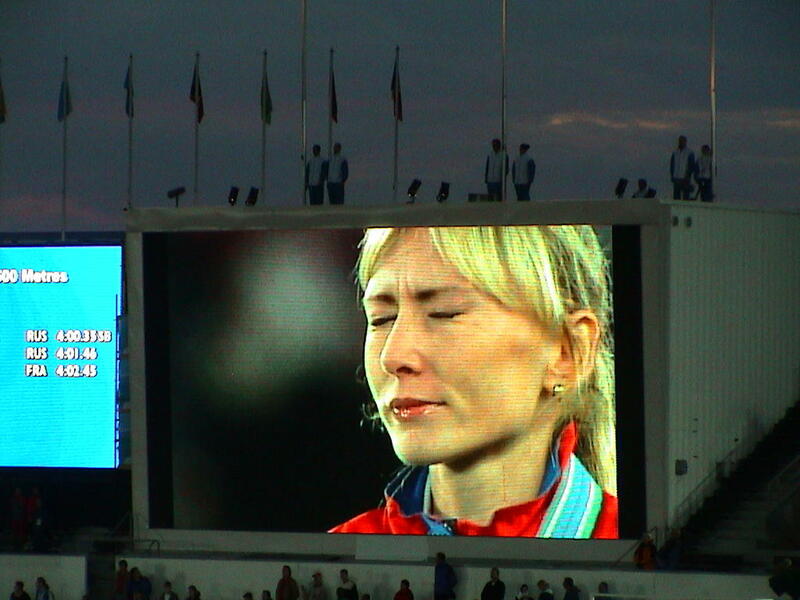 It was amazing, seeing that particular javelin throw. The javelin just didn’t stop and went on and on along with the collective “ohhhh’s” of the audience and finally landed outside the last boundary line made for javelin throws. I don’t have any shots of that. But I don’t regret that. At times, one forgets to enjoy the experience in a bid to capture that moment forever. Some irony. Even though I have seen on TV that more than one events take place at the same time, it was weird with so many happening at the same time that one had to instantly switch ones vision (as if channels) from one point of the stadium to another. At times people kept concentrating on the wrong end for eg. at the introducton being given for a men’s 4X400m final instead of where the real action was happening at that point (women’s javelin throw). Apart from the games, I saw just how much pressure all players face. I also saw the glistening pride on the faces of the winners. Whenever any medal awarding ceremony took place, the flag of the nation which stood first, was hoisted and the national anthem played. Many a time, tears of joy would silently be overtaken by the evident pride. My only regret – I could not cheer for India.